Having operated a denture practice for over 50 years, we’ve found that people have many questions about denture adhesives. These are Dr. Kandarian’s responses to commonly asked questions about denture adhesives. Don’t see the answer to your question here? Email us at questions@stabildent.com. What is the best holding denture adhesive? The million dollar question and our answer. What kind of denture adhesives are available? See what the three types of denture adhesives are here. What is the best adhesive for a lower denture? There is not a denture adhesive designed specifically for lower dentures but Stabil-Dent’s patented design is specifically for the lower denture. What are the effects of Zinc in denture adhesives? See our page on Zinc in denture adhesives. 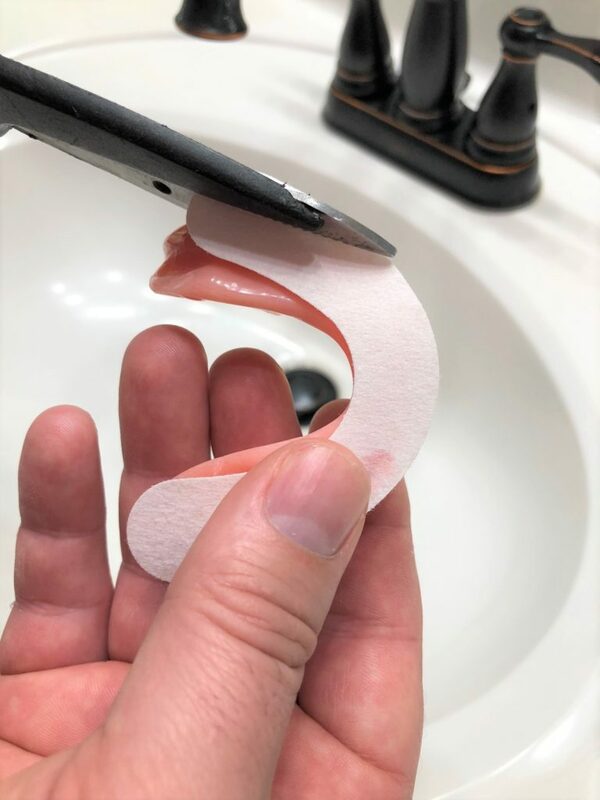 What denture adhesive is most like Cushion Grip®? Cushion grip was purchased by Bayer and then discontinued. I do not know the reasoning and as far as I know there is not a similar product on the market. We feel Stabil-Dent can help any adhesive provide the stability that Cushion Grip® provided. What is the longest lasting denture adhesive? There is not a denture adhesive sold that is marketed as having the longest lasting hold. Again, your saliva and oral condition will determine which adhesive holds longest for you. Remember, denture adhesives should only be utilized after the natural teeth have been removed and the tissues are healing. The duration of this treatment should be for no more than 6 months. Is there a semi-permanent adhesive for dentures? Yes; it is called a reline. I know I’m being smart here but a reline really is the best and only way to fix your denture for the long term. How do I remove denture adhesive from my mouth? We have found denture adhesive sticks to cotton. We recommend using 2×2 cotton gauze pads to remove the denture adhesive left over in your mouth. 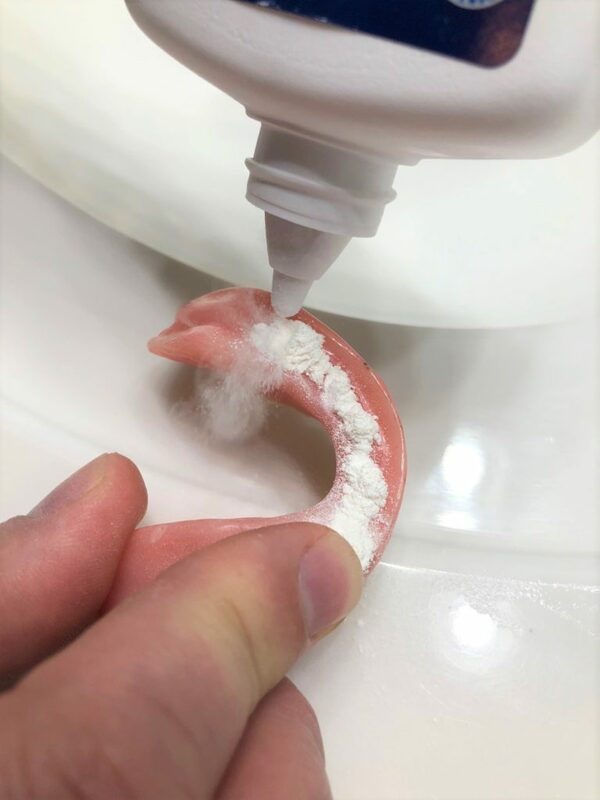 What is the best way to clean denture adhesive? By using hot water and a mild detergent with a toothbrush to get down into the tissue bearing areas of the dentures. While you are cleaning the dentures with your toothbrush, you should actually be brushing the tissues in your mouth with a clean toothbrush so as to stimulate the nerve endings that once were attached to your natural teeth. This brushing of the tissues should be done at least twice a day. This will help keep your tissue healthy and slow done the shrinkage process. What is the best adhesive for a new denture wearer? As I’ve stated, a trial and error approach should be utilized to find which adhesive works best for you. Remembering that you should receive tissue conditioners from your denture provider while the tissues are healing and adhesives should not be necessary if tissues conditioners are done correctly. Can powdered adhesives damage dentures? What is the best way to remove denture adhesive from your gums? We use sterile 2X2’s (cotton swabs will work) because the cotton material will actually grab the adhesives. 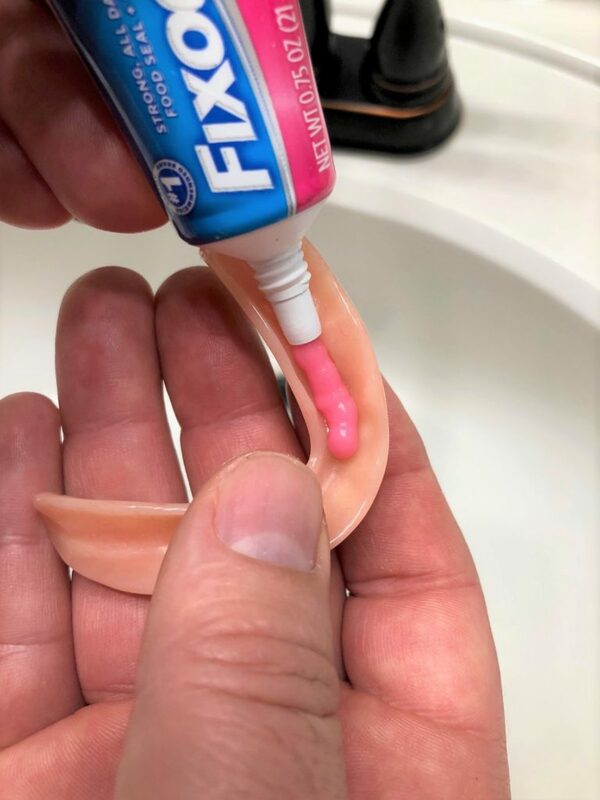 Other than that, a toothbrush will help loosen the edges and then it’s simply a matter of grabbing the edges and pulling it out piece by piece. Is there long term danger of using adhesive for dentures? Long term usage of denture adhesives will not harm you so long as you are not using a ‘zinc’ product adhesive. I don’t believe there are any zinc product denture adhesives available anymore. What is the next best adhesive to Cushion Grip thermoplastic denture adhesive? There is no next best product to cushion grip as far as I know . Get you dentures appropriately relined and a denture adhesive should not be necessary. How long after tooth extraction is it safe to use denture adhesive? The general healing time for tissue healing is 6 months. The denture[s] should receive tissue conditioners if there are a lot of extractions during the healing time. Small amounts of denture adhesives can be utilized to help with the stabilization of the denture[s]. I know of no magic adhesive that the Japanese, Russians, Chinese or anyone else are hiding from us. Is there a denture adhesive that works with hot drinks? I don’t know of any that hot drinks won’t loosen. Why does my denture adhesive not work very long? It could be that you haven’t found the one that works best for you or it could be that your saliva will not allow a denture adhesive to bond with the tissues. As soon as practical and possible, you should get your dentures relined so they fit your oral tissues properly.